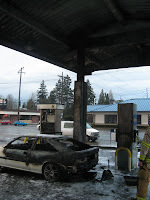 Narrative: At 7:15 a.m. Sunday February 7, 2010, 10 companies of Tacoma and Central Pierce Fire and Rescue Firefighters – 5 Engines, 2 Ladders, 2 Medic units and Command Staff responded to a reported car fire at a gas station at 8247 Pacific Ave.
First arriving companies found a fully involved sedan with fire extending into the gas station overhead. Crews attacked the fire in the roof structure with a hand line and used a compressed air foam system to fight the fire in the vehicle (foam helps put out petroleum based (Class B) fires). Aggressive work by the crews contained the damage to the vehicle and minimized the damage to the nearby pumps and the overhead roof of the station. Currently the cause of the fire is under investigation and there were no injuries to report.